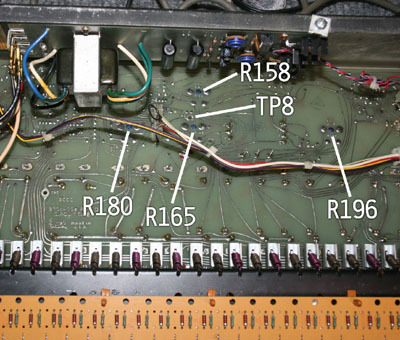 This procedure will walk you through the process of calibrating (tuning) an Arp Axxe synthesizer. The full calibration requires a voltmeter, a frequency counter or tuner, and an oscilloscope - however, you can get the synth playing perfectly in tune quite easily even if you only have an iPhone – simply download an app (such as Fine Tuner) which displays frequency measurements in Hz, skip the power supply calibration, and follow steps 2 through 5 for the Main Board. This procedure requires working on the keyboard with the power on and the power supply exposed, so this calibration should not be attempted unless you are confident in your abilities to work safely, and to use the necessary equipment. Make sure the keyboard has been powered on for at least 15 minutes to warm up prior to any calibrations, and perform the calibration steps in the order they are listed here. 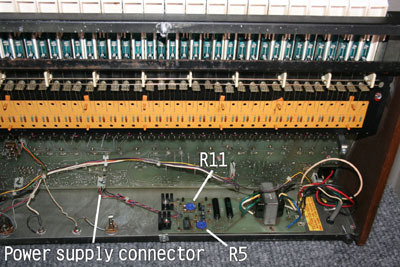 The power supply has one three-wire connector that plugs to the main board. It is easy to plug this in backwards, so first, use a Sharpie to mark the position of the connector before removing it. The purple wire goes onto the pin closest to the transformer. 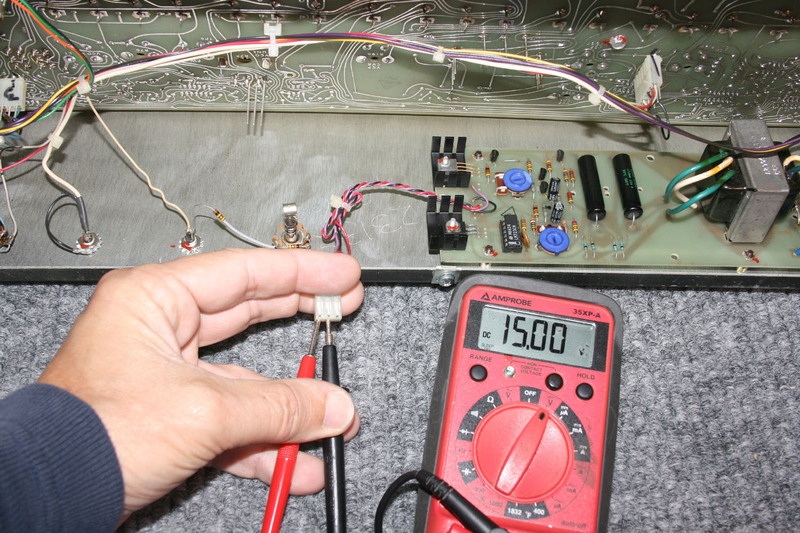 Unplug the power supply wiring harness, and measure the DC voltages by inserting your meter leads into the connector. The middle wire (black) is ground; measure between this and the other two wires. Measure the voltage on the red wire. Adjust R5 for +15VDC. Measure the voltage on the purple wire. Adjust R11 for -15VDC. Plug the power supply connector back to the main board, making sure it is oriented correctly. 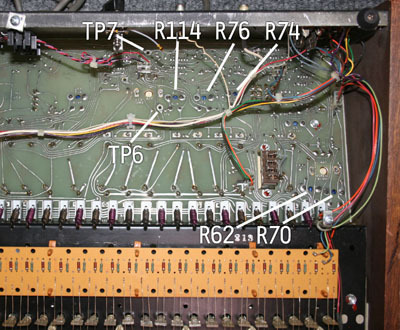 Set the Pitch Bend control and Tune controls to the mid position, and set the Transpose switch to its middle position. Set the Noise Generator and Keyboard Repeat switches to Off. Set all sliders all the way down, except set both VCO sliders (square and sawtooth), VCF Freq, and ADSR Sustain fully up. Set the VCA ADSR slider to a comfortable listening level. For the next steps, you can use a frequency counter, grounded to the center pin of the power supply connector, or you can play the synth through speakers, and use a tuner or app which displays Hz. If you are doing the latter, you will need to hold keys down, or tape them down when you play them for the following steps. If you are using a frequency counter, you will only need to play the specified key momentarily, and you do not need to hold it. Measure the frequency at TP6. Play the lowest key, and adjust R76 (VCO CAL) for a frequency of 130 Hz. Play the highest note on the keyboard. 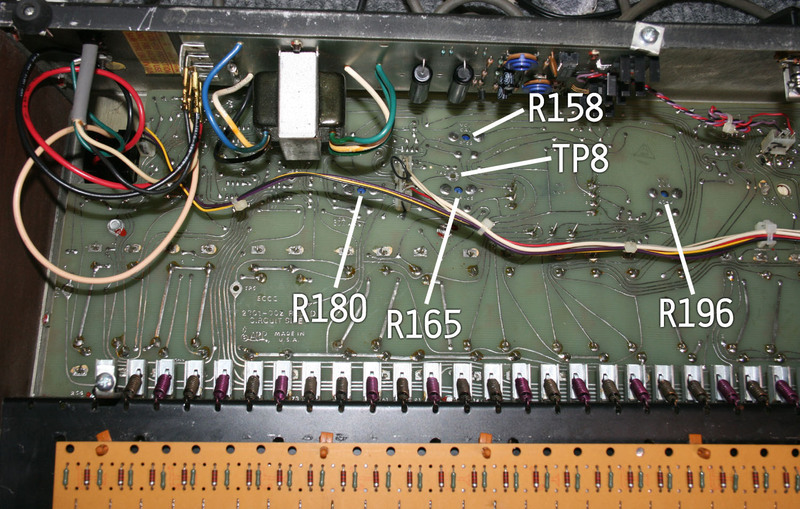 With the frequency counter still at TP6, adjust R74 (VCO V/OCT) to get 1040 Hz. Now play the lowest key again, and make sure it is at 130 Hz; if not, repeat steps 2 and 3 until the correct frequencies are obtained. Switch the Transpose switch to the 2 OCTAVES UP position. Play the lowest key, and with the frequency counter still at TP6, adjust R62 (TRANSPOSE CAL) to get 520 Hz. Set the Transpose switch back to the middle position, and turn the Pitch Bend control fully clockwise (to its highest position). 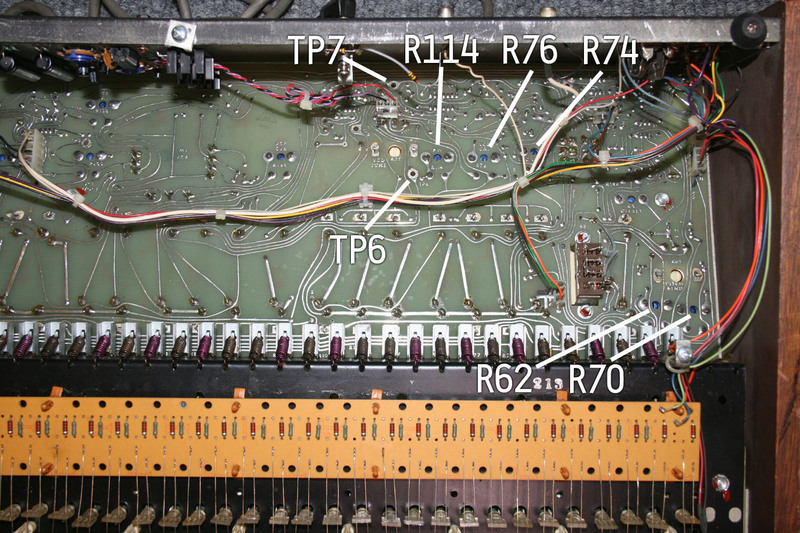 Play the lowest key, and with the frequency counter still at TP6, adjust R70 (PB CAL) to get 260 Hz. Put all sliders fully down, and set the Pitch Bend control to its middle position. With an oscilloscope, monitor TP7, and observe the shape of the square wave. Adjust R114 (PW) for a 50% duty cycle (the upper and lower peaks of the wave should be identical in length). Move the LFO FREQ and VCA GAIN sliders fully upward, and set the KYBD REPEAT switch to AUTO REPEAT. With an oscilloscope monitoring the audio output, adjust R180 (VCA CVR) to get minimum amplitude of the output. Move all sliders fully down, except set VCF RESONANCE fully upward. With the frequency counter, measure TP8, and adjust R158 (VCF CAL) to get 16 Hz. Set the VCF RESONANCE slider fully down, move the VCF LFO slider ¾ of the way up, and the VCF ADSR slider fully up. With the AUTO REPEAT switch still on, use an oscilloscope to monitor TP8, and adjust R196 (VCF CVR) for minimum amplitude. Set the VCF RESONANCE and VCF KEYBOARD CV sliders fully up. Play the lowest note on the keyboard, and measure TP8 with a frequency counter; adjust the front panel VCF FREQ slider to get a reading of 130 Hz. 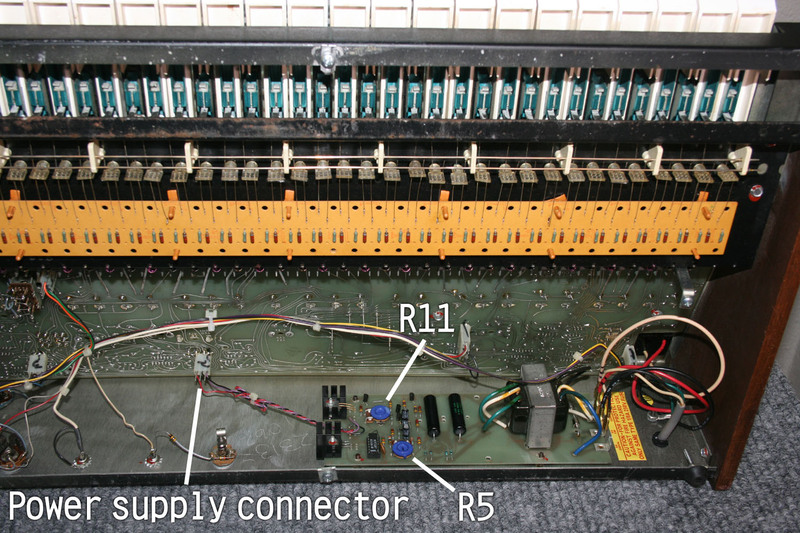 Now play the highest note on the keyboard, and adjust R165 (VCF V/OCT) to get a reading of 1040 Hz. The Axxe is now calibrated. The filter will should track perfectly with the keyboard. You can test this by moving the three AUDIO MIXER sliders all the way down, and setting the VCF resonance fully on - you should now hear a sine wave sound, and the VCF FREQ slider will control its pitch. With the VCF KYBD CV slider fully upward, the filter should play chromatically as you play the keys.